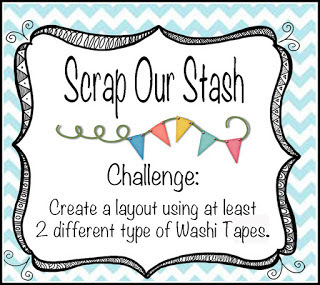 As mentioned in my previous post, this month Scrap Our Stash teamed up with The Memory Nest, My Scraps and More, and Challenge YOUrself to bring us a host of challenges for 'ScraptoberFest'. All up, there were four challenges, one from each of the blogs, plus a bonus challenge. 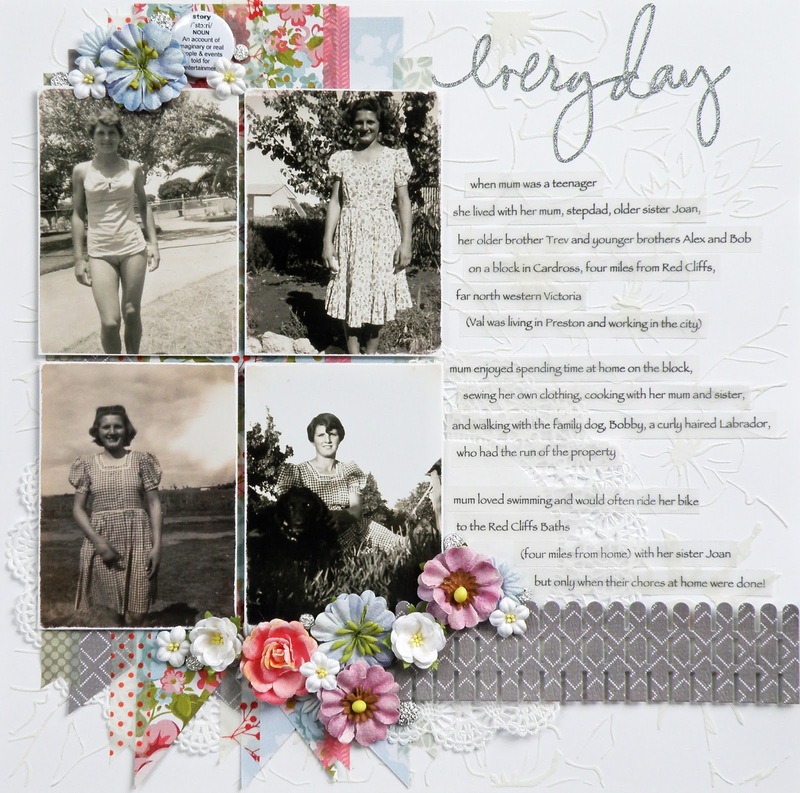 The bonus challenge was to create a layout incorporating all four challenge criteria. I didn't get to all the challenges, including the bonus challenge, but I'm figuring three out of four, or five, ain't bad. Having already completed the My Scraps and More colour challenge and The Memory Nest's sketch challenge, I moved on to the Scrap Our Stash challenge to incorporate at least two different types of washi tape on a layout. Such a great challenge given that, like so many of us, I have collected, collected and then collected some more, washi tape. Yet I rarely use it and it lasts forever. As in you can never, ever, ever finish a roll. It literally lasts forever. I've incorporated four different washi tapes in my patterned paper layers and yep, you'd never know it to look at my washi tape stash. This layout was a 'do-over'. 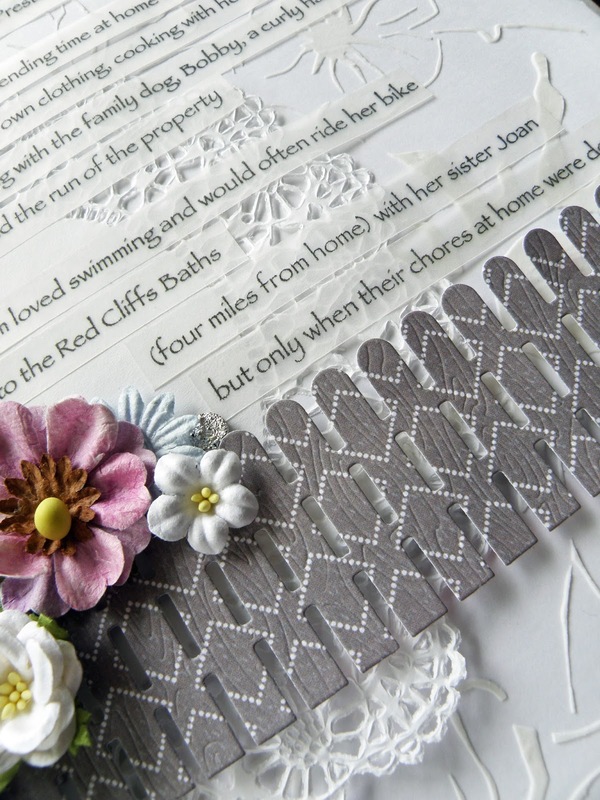 As I finish off my mum's album, there are some pages which just need re-doing. Sure they show an interesting progression of my scrapping over the years, after all I did start this project ten years ago, but some pages really, really, really just needed a fresh approach. This is one of them. Originally all four photos were on a double layout. It was completely unnecessary and as my mum hasn't seen this new page, it will be yet another surprise for her. Anyways that's it for me today and this month. I've no idea what scrapping I'll get to in November. With school, study and vocational placement, on top of managing a home, time to scrap is scarce. Plus I'm so, so tired that quite truthfully, the mojo has long deserted Camp Alz. Nonetheless I am determined to finish my mum's album as soon as possible, and well before Christmas, so I have my fingers crossed there will be some fabulous challenges next month to inspire me to continue with the final few layouts. WOW, Alz! Your layout is fabulous. The photos of your mum are amazing and I truly love the way you did your journaling, too. 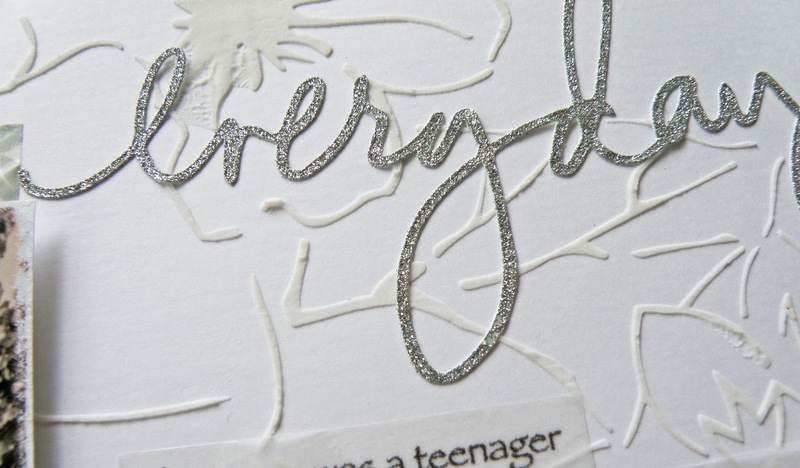 You used the washi tape beautifully here. 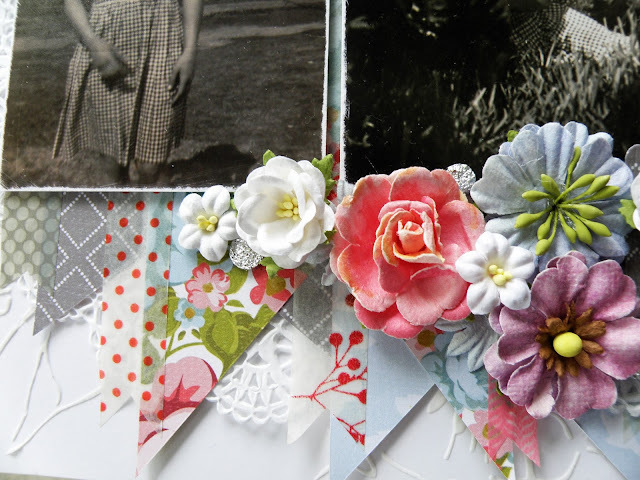 Thank you for joining in on the fun for Scraptober Fest and for linking your layout to Scrap our Stash! Gorgeous page and wonderful job with the washi tape! Thank you so much for playing along with Scrap Our Stash!